I too like miniatures with more realistic proportions. I would just prefer Tre's miniatures were larger. There are many examples of great miniatures out there with realistic proportions that are taller than Tre's RBG stuff. 28mm is not some magical height above which a miniature becomes a hamfisted bobble head. If Tre were to increase the scale of his miniatures while keeping the same proportions we all enjoy, 1) Everybody who likes miniatures with realistic proportions would still be happy 2)People with large existing collections in more current scales would be happy since Tre's miniatures could now be used alongside their current miniatures 3)The only people unhappy would be people who have fantasy collections in primarily the 25mm scale. Do you think group 2) or group 3) is larger? Again, realistic proportions are not tied to any one scale. You can have miniatures that stand 35mm tall with super realistic proportions, and miniatures that stand 25mm tall with super realistic proportions. As an extra bonus, it is much easier to paint miniatures with realistic proportions when they are in larger scales. Again, the problem is that then you would have a 'heroic' model and a model in a different scale with more realistic proportions. That is, the bobble head model's head would be a bobble head lower than the head of the other model. It would be like all of Tre's models are 8 foot tall behemoths with realistically sized heads. 28mm is not a "magic" scale, but you are assuming that a realistically proportioned model representing 6' tall humanoid would look "better" next to an unrealistically proportioned model representing a 6' tall humanoid that was a head shorter. Putting a 35mm model next to a 28mm model doesn't look right, regardless of what the model's respective proportions are. They are out of scale. Tre's models aren't smaller in scale than other 28mm models. They just look smaller because the details are finer. Head to toe they are roughly the same size if you look at models both representing something that is supposed to be the same size. Now, Tre's range has an internally consistent scale, meaning that his Aelfar are smaller and slighter than the Aenglish. So your Aelfar models actually are smaller than some other 28mm models because the Aelfar are short. My wife is 5'1" I am 6'. If we were both shrunk down in size to 28mm models, she would still be a head shorter than me. Her model would represent a 5' tall human, not a human woman whose eyes are literally 28mm from the base. So you might pick up her model by itself without any context and say, "Oh, this is a 25mm model." But if you put that model with other models in the same scale, you would get the impression that the was just a short person. There's natural variation in height, and in a fantasy setting, different humanoid races often have different average heights/weights. Contextually, Tre's models reflect that. In GW's range on the other hand, a Space Marine model is eye to eye with an Imperial Guardsman model. A fact which some purists don't like. Kirasu: Have we fallen so far that we are excited that GW is giving us the opportunity to spend 58$ for JUST the rules? Surprised it's not "Dataslate: Assault Phase"
AlexHolker: "The power loader is a forklift. The public doesn't complain about a forklift not having frontal armour protecting the crew compartment because the only enemy it is designed to face is the OHSA violation." AlexHolker: "Allow me to put it this way: Paramount is Skynet, reboots are termination attempts, and your childhood is John Connor." 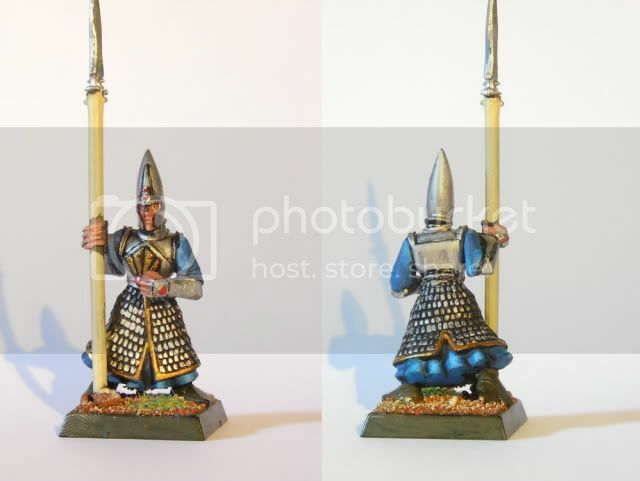 If RITides is correct in saying that Tre's mini humans are 25mm tall, then they could easily be 5mm tallerthan they currently are and still be no taller than a GW elf, guardsman or space marine. Frankly, they sound like Warlord minis' "28mm" Romans, which are petite to the point of being adorable next to any '28mm' fantasy miniatures out there, and put me off of ever buying any of their kits again. Maybe if one of you guys could post a photo of some Red Box minis next to...anything else, we could see just how close they are in height. If I had to vote, I'd vote to keep his traditional scale and proportions. I love them. The minis that I bought were not aimed to be used with a particular game, I bought them just for collecting. I still might use his minis with GW armies, I don't care the difference if they are both cool. Thanks for that - very nicely done! Also, that's a slick looking blog you've got there! Looks like they scale OK with LoTR - which probably means they do NOT scale well with WFB. And you can see that Tre's miniatures are actually taller on average than the LOTR miniatures. If Tre's models were all standing up straight, they would be at least half a head taller. LOTR isn't just more realistically proportioned, it is also a slightly smaller scale, being ~25mm versus ~28mm trending towards 30mm. Thanks Weeble and Azazel for the very helpful posts. As fro the scale of RBG figures.....they are definitely NOT 25mm scale. In fact non of my human models are posed shorter than 30 mm tall. My figures ARE true 35 mm scale. Because the Human males ( which represent the average figure in the range ) are built on armatures that are 35 mm tall from the bottom of the feet to the top of the head with both feet together and back straight. Their height only reduces as the figure is posed. The proportions that I sculpt in are as correct as I can make them. I do this because I like it and I assume that there are a lot of people out there who also like this scale. I understand that people want their collections to work together but that has never been my goal. My goal has been to product the best quality product I could to the fantasy table top gamer market. It is regrettable that the market I am playing to is smaller than the market that prefers the exaggerated cartoony scales but it is the market I have always intended to play to none the less. I do nto mean to offend people who prefer the exaggerated stuff. I like quite a bti of it myself BUT consider it this way.....If the same " cohesive whole " logic was applied to video games as it is to table top games we woudl all still be playing the umpteenth variation of space invaders! truly imagine what 40K would look like sculpted to the same ethos as the RBG range. And thanks everyone who likes and supports the RBG range!! Have you considered doing some figures for Mantic? They scale pretty well with them. This is true, though the Mantic stuff often has outscaled heads compared to RBG. Tre's models aren't smaller in scale than other 28mm models. Look at the picture I copied above again. Now consider the fact that most people looking at a cropped image of the RBG dwarf will assume the base is a standard size... and you see the problem. So, all those figures should be about the same size, right? The female model literally looks like it's going to fall apart if you look at it funny. But go back and look at the pic above... was there any way you could tell it was that slender? No, because it filled the base it was standing on- likely a 10mm or 15mm base. I love Tre's sculpting, but the way he crops his images with no size reference and with whatever smallest base size will fit under the model, even within his own range you are sometimes completely guessing as to what size the model will be that you'll actually get. The dire wolves compared to Fenris in the above pic would be another example of that (both from his range, but impossible to tell the size difference from the pics he posted... and the fluff reason I did not find out about until afterwards). I hope this does not come across negative- I am just trying to demonstrate the problem, which for some reason never seems to get communicated clearly, that it is impossible to tell the size of RBG models from the pics that Tre posts! If he would at least list the base size used in pics, that would go a long way, or if he would use a standard size... but putting a super slender model on a 10-15mm base makes it seem so much larger than it really is. I agree with that point RiTides- the smaller round bases really do make it harder to tell the size of the miniatures. have said this before, your sculpts are amazing. It is not always a 'bad' thing not to be running with the crowd. It is one of the things that makes your minis stand out. The only hit you will take is the minis being used as 'counts as', It may hurt sales now, but as you develop your line and at some point a game to cohesively bind the line you will be happy you chose to stay with your vision IMO. Any resemblance of this post to written English is purely coincidental. Tre's models aren't smaller in scale than other 28mm models. They just look smaller because the details are finer. Your last line is key. Tre's models look smaller because the details are finer. 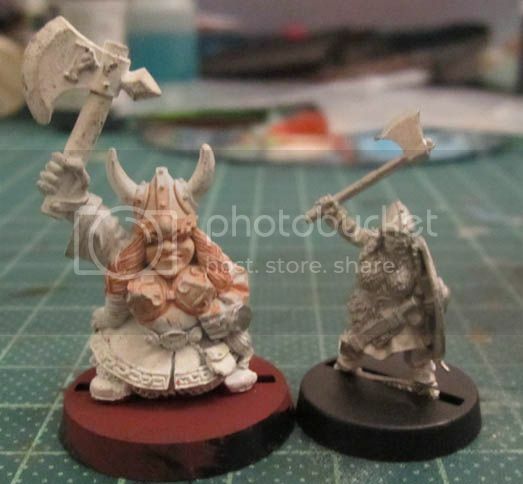 Even if they are 35mm from head to toe, do they look better to you standing next to 25mm LOTR minis, or standing next to say a GW warrior of chaos? When it comes to fantasy miniatures, bigger is always better. 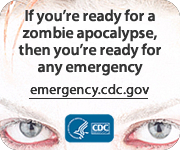 Particularly when you are dealing with barbarians. It is much easier to mix in a few larger models into a collection, than to mix in a few smaller models. You mix in a few bigger guys (45mm to top of head with super fine details for instance), and they just become the big tough guys of the group. They look intimidating. You mix in a few smaller models, and they become...the really short children of the group with tiny wrists and tiny cute little pin swords. Basically, it is always better to deviate from your mean height/scale in the positive direction in a fantasy setting than in the negative direction. Bigger models are also easier to paint. There is a reason that other boutique miniature companies with fantastic sculptors gravitate towards larger scales. Anyways, the point of raising this whole issue was to point out that I don't think Tre's business has been as hurt by KS1 as he estimates (Good news! ), rather it is people discovering as RiTides and others did that Tre's miniatures are either tiny, or look tiny compared to the majority of fantasy miniatures out there(Cool if you are into that!). I hope this next KS goes great. And my dream is basically to become wealthy enough I can hire Tre to sculpt me a set of fantasy inspired vikings with great proportions for a set of injection plastic molds that I will then sell to the world. Anyone with any aspirations towards producing fine miniatures needs to discount the possibility of trying to scale anything next to Games Workshop's brigade of simian disco rejects. Both ladies' eyeline seems to be the same distance from the base. It's just that one of them is a gigantic bulbous monstrosity that should never have left the 1990s. That's a slightly unfair characterization of a lot of their stuff, but several armies have such idiosynchratic styles that they cannot be matched by realistic proportioned miniatures in anything akin to a seamless fashion. GW dwarves are one example. They're very gofy. I liked GW styles a lot when I was in my teens, but I can't really stand it anymore. I've been moving towards liking a more slender/truescale style, with Perry minis and other historicals (NOT Front Rank), some Mantic, Red Box Games, etc. ^^ WTF is that guy doing!? is that left arm 6 feet long?! I agree wholeheartedly. GW's style especially is pretty over-exaggerated. It's cool if it's your thing, but I think painting so many GW orcs over the years has made me a bit burned out on it. I also find PP's over the top style tiring. I love Tre's dwarves. They look the way I always imagine fantasy dwarves to look. I can't wait to get some more from his second KS! This is all I meant, really... If Tre would just photograph his models so it is possible to know what size they are, I would have zero issues with them. Sorry for the derail a bit, but to get back to the Kickstarter, it did make me wonder... what size bases are these Njorn shown on? I had assumed 25mm rounds, but looking again I see they hang off the edges... so are they 20mm? Any scale shot would be great, or even just that info (base size) would really help. Exactly. This is my point. Well, I can certainly agree about the "bulbous monstrosity that never should have left the 90s" part . Looks especially silly next to Tre's excellent sculpt! I have the start of a lot of LOTR armies that I was buying before the prices kerploded, so I'm actually more interested in these figures now. Will Redbox still be releasing Trollcast (or non-metal) figures in the foreseeable future? By the time I have money for sampling new ranges, I'm afraid Tre's stuff will only be available in metal. It's already metal only for the most part, Bob, unless you were in on KS1 or can snag some extras from it. Metal suits his delicate sculpts well, though. There si no such thing as 15 mm bases. There are onyl 20 mm bases and 25 mm bases, 30, 40 and 50 and 80. Rest assured that EVERY Human male is built upon a 35 mm armature except for the Journeyman Gerard who is half elven. He is built on a 30mm armature. FEmale humans range from 30 to 32, Elves range from 28 to 30 between femal and male respectively. Dwarves all range from 22 to 26 female and male respectively. There is not variation in height amoungst RBG figures that is out of the norm with other RBG figures. I do not make proxy figures and do not at all intend that they be used as proxy figures. If there is any misleading advertising it is in the use of the descriptive 28 mm Heroic scale. Fenris is a wolf god, the dire wolves are just slightly larger wolves. Yrsa is half Elven and the Helsvakt tend to be brutish humans. Hence the difference there. I understand that the confusion is rooted in the long tradition in miniatures of moving the criteria of " scale" every year or so but with RBG every figure will ALWAYS match what it is supposed to be within the context of the RBG world. If you see pointed ears it is either an Elf or a Half Elf so it will always range within 28 to 30 if it is female or 30 to 32 if it is a male. Dwarves all fit with one another, Humans all fit with one another and all these races fit with one another as they would in any given old school fantasy art work. That is the mission of RBG to provide the most internally consistent line of fine scale fantasy models on the market. I tell people the height of figures all the time and then people still give me grief that the figures are " smaller " than I tell them because they have a specific ( most often totally wrong ) idea of what a given measurement will look based on what other manufacturers tell them a particular measurement will look. 28 mm heroic is a manipulation. Plain and simple. Take any 10 28 mm heric figures from any particular manufacturer and measure up to 28 mm on each one and tell me if any of them measure 28 mm to the same spot on the mini. For that matter are any of the arms legs and torsos the same length or girth? It is not a measurement it is a marketing gimmic invented to help get a line of figures that was MUCH larger for the time into nationwide distribution. The problem is, if internal consistency is the goal, that is only being accomplished if a person knows the background and reasoning for each model to be the way that it is. That background would be fantastic to see! But usually, it isn't posted, and although I totally believe that you are working to a specific goal with the size of each figure, there is no way for us (as customers) to know that. Nigh the size of a man and the ravenous hunger of the great wolf god himself the Dire Wolves race through tangled wood and over open ground with equal ferocity slathering jaws agape to rip and rend the flesh of their prey, man and beast alike it matters not when the Howling God leads the way.. Summoned forth from the deepest primordial wilds they serve the will of Fenris only! 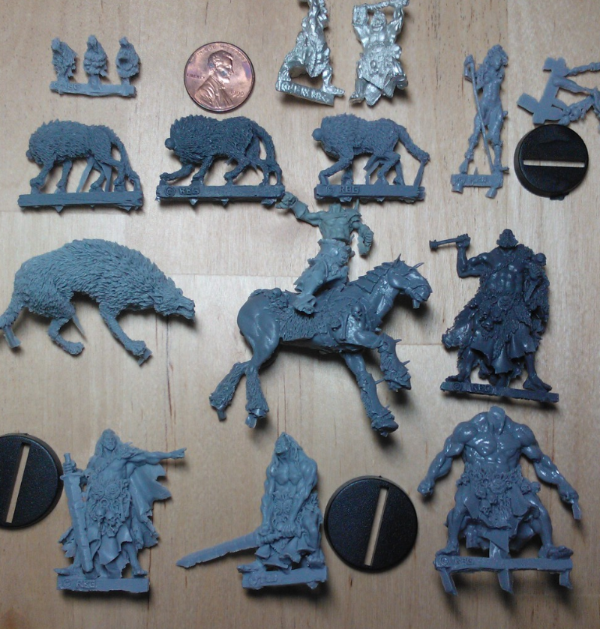 Almost the size of a man the Dire wolves will be a set of 3 wolf kits fitted for modularly interchangeable heads. ...these beasts will be available as a rank ( 3 figures ) option or separately as a set ( 3 figures ) for $18.00. "Nigh the size of a man" isn't much to go on, when it seems (to me at least) that they turned out quite a bit smaller! Likewise, Yrsa is not described on the main page as half elven... maybe it was mentioned somewhere but that is the point, it is very hard to know what you're getting! All I'm saying is that, it would really help to make it more clear... I hope that came across. I won't make this point any further but the reason I really tried to here is that, despite it being brought up a number of times, you have not changed your methods in presenting your miniatures for the most part... it is the presentation I am talking about, not the scale- I really wish you could distinguish the two, and make it more clear what it is that you offer! Many people will still love it and buy it, and you'll have less issues of confused customers that way. All of these figures are cast in a single piece and will be cast in high quality lead free white metal and will be supplied with a 25 mm round plastic base. Yep the New Njorn are pictured on 25 mm bases. As before and always all Human male figrues are built on 35 mm armatures and then posed into whatever height they end up being. I do understand though that there is confusion in the equation fromt eh word go and that I coudl better clarify the issue. I certainly do not intend to hide the size of my figures at all or even slightly mislead. When I said the dire wolves are " nigh the size of a man " I meant exactly that. Near the size of man. The wolf armatures are built the same way I built the human armatures. The only difference being that the hind legs are shorter than those of a human and the torso of the wolves is a little longer. When you take a human and pose it down on all fours with 2/3's the length of it's legs you will get the exact same size figure as the dire wolves. So they are indeed near as big a human just not standign upright on two legs and so they are " shorter ". Anyway I hope I am nto coming across as argumentative. I know I probabyl am but I do nto intend to be so. No problem, Tre- I was actually worried I was the one coming off argumentative lol... I'm sure much more than your posts were (yours were very polite, imo). I really appreciate the dialogue, and I just hope the main point I was trying to make (that it's the presentation of the minis, not their actual scale, that sometimes causes issues) was clear! I would also love it if the pics of minis included a mm/cm ruler in the frame. As everyone's computer monitors, resolutions, etc, are all different, that one added bit makes discerning a mini's size infinitely easier. The majority of other miniatures companies don't do that. Tre's miniatures look small because I think some gamers are used to seeing fine details like that on larger models. Tre does include the base size in his product descriptions. If you know models and know base sizes and can see the model on the base, that gives you an idea about overall size. Still, Tre's artwork bucks the trend a bit, and some folks find it jarring to see the miniatures in the flesh. Then you look closely and you can't believe the miniature has do much life and detail. And they paint up nicely too. I own... quick calculations, over a hundred Red Box Games miniatures So I am very familiar with them. Tre is a great guy and fantastic sculptor and those two reasons are why I keep coming back and buying product. I am not faulting Tre specifically for a not having a ruler in his pics, as I also wish the majority of other miniatures companies did that as well. I only bring it up in relation to Tre/RBG as it's a RBG thread and not a generic all miniatures companies thread.